Kothi Hayat Baksh was constructed for Nawab Saadat Ali Khan, who was a dedicated builder and liked European architectural styles. General Claude Martin built this opulent Kothi for him. The Kothi was later awarded by the Nawab to Martin as his abode, and came to be known as Banks House when Major Banks occupied it. 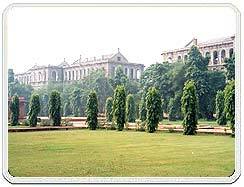 In 1873, when George Cooper was the resident, roomy lawns were produced around the Kothi, and a ballroom was added as late as 1907. After Independence, Kothi Hayat Baksh became the residence of the Governor and came to be known as Governor House.